Create and open virtual DVD-ROM and ISO files"
The ISO files are recent and are very popular because they can compress a lot of files and can be opened as virtual CD/DVD ROM. This software manage all kind of aspects related to ISO image files. You can create, copy, edit or extract ISO files. You can vreate bootable disc with your operating system or another software that requires to be written as bootable media. Also, you can create multiboot discs. You have your CD/DVD but you just want to add some graphical content to it, this is the time you need a tool like this to come in handy to create and design for you an image for the CD. It is a simple application that is ideal for all users despite the level of experience. 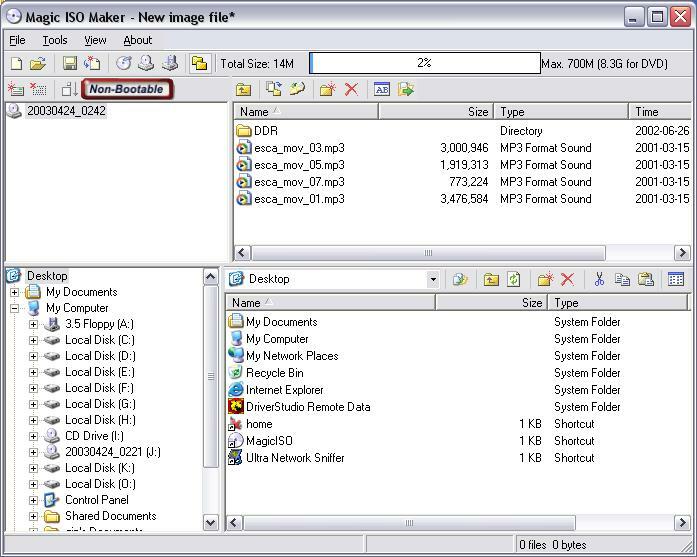 You can write data on a dics – DVD or CD – and this tool is focused on ISO files; for audio, video or other files you can use tools like Nero. It is a tool that looks a little bit cluttered on the interface but it is the simplest of all. It is part from disc images utils category and is licensed as shareware for Windows 32-bit and 64-bit platform and can be used as a free trial until the trial period will end. The MagicISO demo is available to all software users as a free download with potential restrictions compared with the full version.